Thursday, August 02, 2018 - This shocking video showing a trained pitbull dog robbing a man in public is going viral. 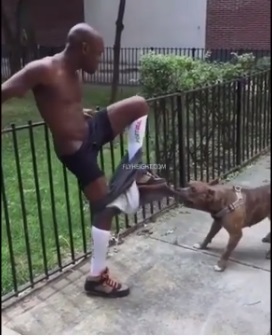 After forcing the poor guy to remove his shorts, the dog went for his pair of shoes. This is the reason why some people shouldn't be allowed to own animals. Dogs are not only good pets but can also provide security and are part and parcel of security forces. But as this video shows, they can be misused by some crazy people.